Place the oats in a large mixing bowl. In a saucepan stir together the maple syrup and peanut butter over a medium heat, until they mix together and become looser. Pour the maple syrup and peanut butter mixture over the oats and stir until all of the oats are covered – the mixture will clump together into little nuggets, and that’s exactly what you are looking for. Scatter the mixture over a large baking sheet – you may need to do this on two baking sheets – and allow to dry out in the oven for 45 minutes, shaking the trays to mix everything up halfway through so that the nuggets colour evenly. Remove from the oven and allow to cool and crisp on the baking sheets. 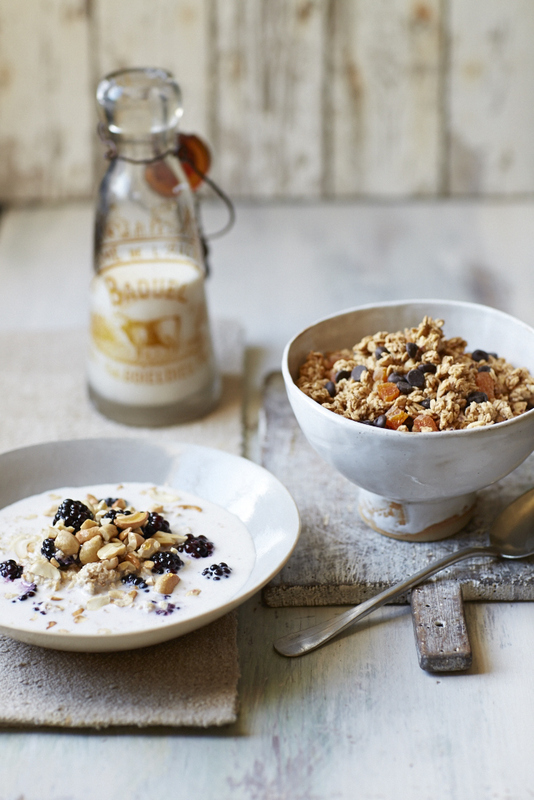 Once cool, chop the apricots into small chunks and toss them into the granola with the chocolate chips and stir through to evenly distribute them. Store in an airtight tub or jar where it will last for a good five or six weeks. This is my favourite contribution to the autumn dinner table, and one that can be served as a hearty side, or as a meal in its own right. Preheat the oven to 200°C/180°C fan/gas mark 6. Grease a 23cm (approx.) pie dish (ceramic is best) with butter. Whatever you do, don’t use a dish with a loose bottom or you’ll be scrubbing your oven floor for weeks. Peel the sweet potatoes and slice each very thinly – I use a mandolin or a food processor, but it can be done using a knife, with a straight eye and steady hand. After you’ve peeled each potato, rearrange the slices as though you were trying to stick them back together to reform the whole potato. Wedge these bundles into the greased dish randomly and at different angles – treat them as though the potatoes were whole, just pack them tightly into the dish. Heat the cream in a medium saucepan over a low heat. Add the rosemary with a pinch of salt and pepper. Once the cream comes to a simmer, remove from the heat and leave to infuse for 5 minutes. Pour the infused cream over the waiting sweet potato. Cover the dish with foil and bake for 45 minutes, then remove from the oven and take off the foil. 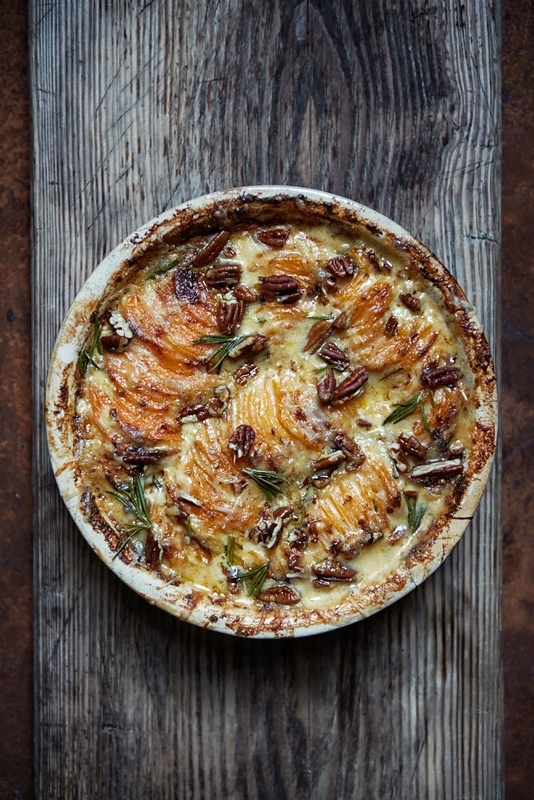 Coarsely grate the cheese and roughly chop the pecans, then scatter both cheese and nuts over the baked gratin. Return to the oven for a further 15–20 minutes, until the cheese top is bronzed and the sauce is bubbling. Allow to cool and set for 15 minutes before diving in. Preheat the oven to 180°C/160°C fan/gas 4. Grease a 30 x 20cm pudding tray. For the batter, beat the butter, 150ml water, 150g of the orange curd, 250g of the sugar, the flour, eggs and grated zest of the oranges until smooth – I do this in a food processor, but a freestanding mixer works ne, as would a wooden spoon and elbow grease. Pour the batter into the prepared tray and refrigerate for an hour. For the sauce, whisk together the remaining 300g of orange curd with 175ml boiling water and the remaining 50g of sugar with the juice of 1 orange. Pour the sauce over the pudding then bake for 50–60 minutes, or until a skewer inserted into the centre comes out clean. Do bear in mind there is sauce in this pudding, which will stick to the skewer. Leave to stand for 10 minutes before you dig in. Recipe from John's book, Perfect Plates in 5 Ingredients. Purchase here. As I write this introduction, I can’t help but giggle at my mum’s comments about this recipe. When I handed a pie to her, on a blustery autumn day, she dug in and without so much as a thank you said, in her Northern accent,‘oh love, there’s a lot of leek in here’. But that’s the point: lots of leeks, because I love them – especially when they are sweetly caramelised and mixed with the dry cider. Chop the chicken into 2cm nuggets. Wash and trim the leeks (if not already prepared) and slice into thin discs. Heat a fairly large saucepan over a high heat and add a glug of oil. Once the oil is hot, add the chicken pieces with a pinch of salt and pepper and fry until all sides are more or less seared. Remove from the pan and put into a bowl, setting aside until needed. very slowly caramelise, stirring occasionally – this will take a good 20 minutes or so. Once the leeks have cooked down, return the chicken to the pan and pour over the cider. Increase the heat to bring the contents of the pan to a boil, then reduce to a simmer and cook, uncovered, for 45 minutes. Remove the pan from the heat and allow to cool. Once the filling has cooled slightly, add the crème fraîche and more salt and pepper to taste, and stir until well mixed. Divide the mixture between 4–6 ovenproof mugs. For the pastry top, unwrap the pastry and cut out discs that are just a little bigger than the mugs, and place them over the filling, tucking the excess pastry around the inside edge of the mug. Bake the pies for 30-35 minutes, until the pastry is golden brown and puffed up. With such reliable jarred varieties available, so many people rarely make their own pesto, but this version just isn’t something you can find in the shops. The Brazil nuts have such a different flavour – obviously more nutty – and seem, in a way, to make the idea of pesto and pasta a much more wholesome affair. For the pesto, roughly chop the Gruyère and simply blitz it with the nuts, basil and peeled garlic in a food processor until blended. Then with the processor still running, slowly pour in the olive oil. You should end up with a fairly smooth pesto. Bring a large pan of water to the boil and add a large pinch of salt and 3 tablespoons of olive oil. Smash the lasagne sheets into uneven shards and add to the water. Boil for 9 minutes then drain – though do reserve 50ml of the starchy pasta water. Return the cooked pasta to the pan and add the pesto. Heat over a medium heat for just a minute, until everything is warmed through. If at this stage the sauce looks a little scant or too thick, splash in some of the reserved water to loosen – though not too much. Serve the pasta with an extra drizzling of olive oil and a few chopped Brazil nuts. The vibrant colour of mixed heritage tomatoes is awesome; there is a whole palette to choose from. I particularly love the green tigers, with their verdant skin and dark green stripes and those tiny little yellow ones with a zingy, sharp flavour. This tart is gorgeous served slightly warm, but I personally prefer it once it has cooled completely. The flavours just seem to have found one another by the time it has come to room temperature. Unroll the pastry onto a baking sheet, and with a sharp knife score a 1cm margin around the edge of the pastry – don’t cut all the way through, but use enough pressure so that the score line is visible. Crumble or spread the goat’s cheese over the pastry, keeping it within the margin. Slice the tomatoes fairly finely – if you don’t have a really sharp chef’s knife, a serrated knife is always a good option. Arrange the tomato slices, as higgledy-piggledy as possible, on top of the goat’s cheese and sprinkle over a pinch of salt and pepper. Roughly chop the olives and scatter them over the top of the tomatoes along with the thyme. 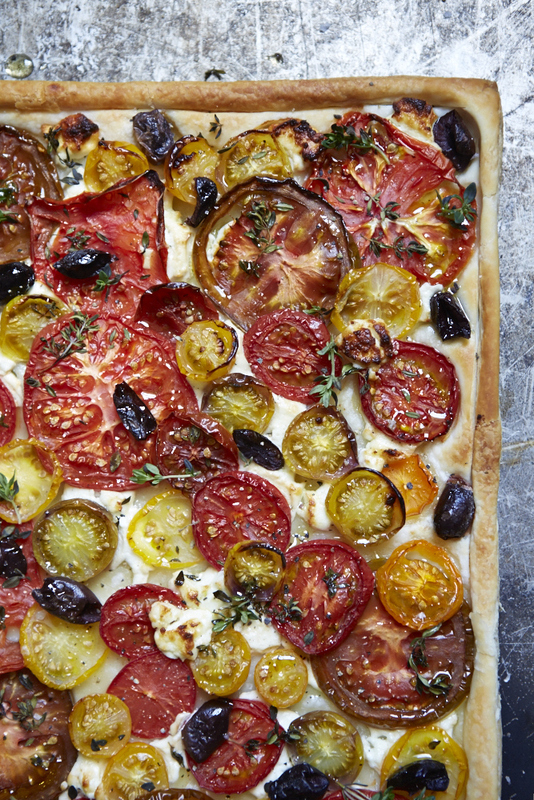 Bake the tart in the oven for 25–35 minutes, or until the pastry has puffed up around the tomatoes and is a light golden brown. Drizzle over a little extra virgin olive oil and serve. Thyme is a personal favourite, but sprigs of fresh oregano are just as beautiful. Tarragon or rosemary are very interesting, but not to everyone’s taste; the choice is yours. I once ran away to Madrid where I fell in love. My love affair was with this dish. I ate it every day for brunch, and I make it so often now.The beauty of it is not only its simplicity, but also that it’s a great recipe to experiment with – adding chorizo or pancetta in place of the sausage works particularly well. Traditionally this is made with potatoes, but this version is a little lighter on the carbs. Slice the sausages into 1cm chunks. Deseed the peppers and slice them finely, chop the spring onions into 1cm pieces and set aside until needed. Heat 1 tablespoon of olive oil in a frying pan over a high heat. Once the oil is hot, add the sausage chunks, turn the heat down to medium and fry for a good few minutes until cooked through, stirring them often. Add the peppers and spring onions and fry for a minute or so, just until softened. Hold the eggs about 30cm above the pan and crack them open, allowing the insides to tumble and crash into the pan. Leave the eggs to fry for 2 minutes or so, until they are only just set. Grate the cheese and scatter it on top, then season to taste. I adore the, somewhat contradictory, delicate boldness of smoked fish. A newcomer might suspect that the delicate flesh wouldn’t take the flavour, but we all know that it just works. That gentle smokiness pairs so well with the paprika-spiked chorizo. The tender leeks and slightly startling bite from the capers takes the flavour of this dish – which is essentially a broth – even further. Slice the chorizo into 5mm slices. Slice the leeks into 1cm discs and place to one side until needed. Heat a heavy, shallow casserole – one you have a lid for – over a high heat and add the chorizo. Fry the pieces, stirring every few seconds, until the chorizo starts to leak out its orange, spicy oil. Once it does, add the leeks to the pan and fry for 1 minute. Add the stock with a pinch of salt and pepper, bring to a boil, then cover with a lid and cook for 40 minutes in the oven – if you don’t have a lid, a piece of foil tightly wrapped around the pan should be ok.
After 40 minutes, uncover the pan and lay the haddock fillets on top. Return the pan to the oven and cook for a further 10–12 minutes, until the haddock is cooked through. Flake the haddock into the broth beneath, scatter over the capers, check the seasoning – though I find this to be balanced enough – and finally, serve. Once of my favourite midweek treats is a bowlful of gorgeously golden gnocchi nuggets. I have dabbled in making my own gnocchi – I love sweet potato and pumpkin varieties – but the packet version is such a handy weapon in the kitchen armoury, offering almost instant gratification. Ordinarily you boil the gnocchi, similar to pasta, but when fried in butter it becomes crispy on the outside and so tender in the middle.To retain that crispness, I don’t want the sauce here to be so thin that it makes the gnocchi soggy; it should be intensely flavoured and thick enough to just coat everything. Finely chop the shallots and add them, with the butter, to a large frying pan set over medium heat. Add a pinch of salt and reduce the heat to medium-low, frying the shallots until softened – a good 15 minutes should do it. Give the pan a stir every once in a while to stop the shallots catching. Meanwhile, slice the mushrooms thinly and roughly chop half of the sage. When the shallots are softened, increase the heat to high and throw in the mushrooms. Stir-fry them for a couple of minutes until they start to soften, then add the sage and pour in the wine. Allow the wine to bubble and reduce so it coats the mushrooms, but isn’t really wet enough to be a sauce. Check the seasoning – probably needs pepper and a touch more salt – then remove from the pan. Clean the pan and return it to a medium heat then add the remaining 50g butter. Once the butter melts add the gnocchi and fry, without stirring or tossing, for 2 or 3 minutes until golden brown. Then toss about in the pan and fry for a few minutes more. The gnocchi should be slightly crispy so it clatters quietly and invitingly when moved. Return the mushrooms to the pan and stir to coat the gnocchi. To garnish, heat at least 3 tablespoons of oil in a small saucepan and allow it to get hot then add the remaining sage leaves, frying them for just a minute, maybe less, until crispy. Remove from the pan and blot on a piece of kitchen paper. Serve generous, heaping platefuls of the gnocchi with a crispy sage leaf or two.